OpenCart has an option available to easily perform Backups and Restorations of your OpenCart database in the Dashboard. We recommend maintaining your own regular backups, so you can recover your website in case of emergencies. 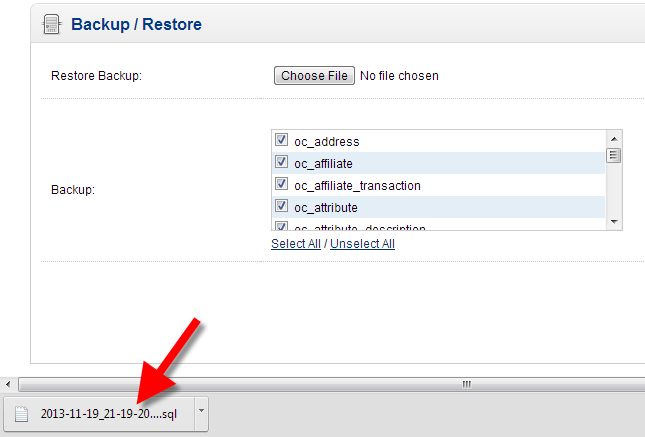 In this guide we will walk you through the backup and restore process in OpenCart 1.5. Login to the the OpenCart Dashboard. Roll your mouse over System, and click Backup/Restore. Select the tables that you want to backup, you have the option to Select All. Save this file for emergency recovery, I recommend using an external hard drive, or CD/DVD. Login to the OpenCart Dashboard. In the Restore Backup section, click Choose File, and select your backup. Click the Restore button, and it will restore your database. The time frame will differ, since large files will take longer. You will then see a message stating "Success: You have successfully imported your database!" Congratulations, now you know how to perform a Backup and Restoration from the OpenCart 1.5 Dashboard! 500 errors literally mean that the server did not know what to do when issued a directive from your application. Typically, we can look in the apache error log and see if it triggered an error there. That's why I suggested reaching out to the Support Department. We would have to look at the server level for an error. Unfortunately I've been left this codebase with little information from past devs. Not the optimal situation. If I were to analyse this OpenCart application for a non-descript error such as this, where's a good place to start? 500 errors are non-descript so your best bet to troubleshooting is to reach out to the support department. They should be able to look into the error message and help you resolve it. I'm attempting to backup an Opencart Database Version 1.5.1 before upgrading to 2.X. Unfortunately when I click backup I'm returned a Error 500 internal server error. This is quite an old application and a little tricky to figure out. Have you got any tips on how I can diagnose the issue here? I and using opencart 2.1.0.1 and installed a paid theme 2.0.2.0. Now its not working, can i take back up of my website and then re install my opencart to 2.0.2.0 and restore it. I am afriad to loose the licence. Thank you for contacting us. It is difficult to say, due to themes being created by separate 3rd parties. Since it was a paid theme, I recommend contacting the developer to see if they have a possible solution or workaround. Most paid themes provide some level of support. As far I as I know there's no direct way to restore a partial backup from a backup file. You would need to restore in full and then remove the data you don't need. HELP! I moved my website from a sub-directory on my server to the root. I did a fresh install of opencart at the new location, then used the "import database" feature in the opencart admin section to import the database that I previously downloaded using that same feature on the old site. I get a green message stating that the import was successful, but nothing was imported - no products, categories, pages, anything. Any ideas? Are you getting any type of error when importing? Thank you for your question about backing up and restoring OpenCart. It is not recommend to restore OpenCart to a different version, since OpenCart core files that may have been changed/updated will most likely break. If you wish to proceed with restoring an OpenCart 2 store, in an OpenCart 1.5.6 install, I recommend contacting a developer that will help you work through the problems. You will also have to ensure that the all OpenCart Addons/Extensions are compatible with the version you are changing to. We would need a bit more information about your situation. For instance, what are you attempting to see restored? What dashboard are you looking into, cPanel or the OpenCart?